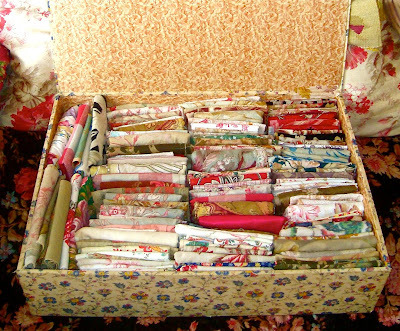 Interesting Antique Textiles: My tidy 'Scrap Box'! I always try to save even the tiniest, most damaged pieces of antique & vintage textiles as they are far to lovely to get rid of and I often refer to them for reference when trying to identify a new textile, or make up patchwork packs if requested. However, they tend to to be stuffed unceremoniously into large paper carrier bags and thrown out of sight behind my old chaise longue in my studio. The chaise has finally had it and I have bought a rather lovely French sofa to replace it, so today I am moving it into my store-room until I can decide what to do with it. I thought it would be a quick job, but I had forgotten about the bags of scraps! An hour or so later, I have a wonderfully arranged new 'Scrap Box', but the chaise is still unmoved... Right, I must stop playing with fabric and get on with it!